The 2011/12 Parents Education Network lecture series in San Francisco began with a bang, a powerful bang. The lecturer, Dr. Leyla M. Bologlu, shared advice that made my heart sing. She underscored the importance of good, thorough evaluation for both ADHD and learning difficulties stating that the faster the parents take action the better. It is now proven that early intervention can impact neurological change. The goal is to ensure that the child has a healthy psychological life as he or she goes through the challenges of the learning process. Some clues: A child exhibiting behavioral issues is a flag that the problem could generate from a brain-based neurological issue. 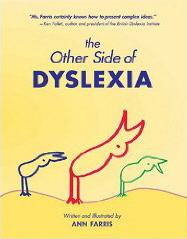 (A dyslexic has different neurological pathways.) Or a child exhibiting executive functioning shortcomings as a result of the brain’s inability to manage learning activities may be experiencing ADHD. Dr. Bologlu gave a graphic description of the brain’s development. The infant brain is relatively smooth. As the child grows and develops the complexity of bumps and squiggles on the brain increases from experience and exposure. This description had me wondering how physically crisscrossed is my brain from my dyslexia and hyperlexia. It wasn’t until I was in my forties when I learned i am dyslexic and in my sixties when I discovered that my real issue is hyperlexia meaning I had trouble in imaging words which are essential for reading and aural comprehension. The lecture moved on to many types of specialists. At the outset is the need for parents to identify a competent evaluator who is comfortable embracing specialists in several different fields with discreet skills to address particular shortcomings. Dr. Bologlu reminded us that kids want to do well. The adult team needs to discover what is holding them back, what skill set they are missing and sets in motion the steps necessary to improve the ability of the child to learn. The path Dr. Bologlu recommends to identify the learning challenge includes. 1. Obtaining a clear statement from the school with details of what seems to be going on/what are their concerns? If it is you, the parent, who is recognizing there is an isuue, ask for a meeting at the school to check out your hunch. Other screenings/tests including but not limited to: Slingerland, Levine, language development/auditory processing, phonological awareness, visual-motor integration etc. development, sensory-motor integration and nonverbal weaknesses. Psycho-educational Evaluation. Be sure the consultant has a PhD in clinical psychology. The evaluations involve IQ testing, achievement tests, behavioral questionnaires, social/emotional testing. Neurpsychological Evaluation. This can include testing for intellectual skills (IQ testing), as well as congnitive functioning ability which may involve testing for skills in a) language (expressive/receptive), b) visio-spatial/visio-perceptual function c) memory, d) attentional systems, e) executive functioning, f) fine and gross motor functioning, g) sensory integration and more. The Educational Therapist oversees the testing process. When she/he receives the assessments from other specialists, she/he draws conclusions and makes recommendations to the parents. The Educational Therapist must provide the names of the suggested treatment providers – more than one for each type of service. In addition, the Educational Therapist should make contact with all of the treatment providers recommended to outline the reason for the referral, the treatment focus and the number of sessions per week needed. medication management. I found it interesting that Dr. Bologhu’s point of view on medication is that it may help with behavior but not with the core issue. At the conclusion of this lecture the President and Co-Foundter of PEN, Dewey Rosetti, when thanking Dr. Bologlu for her remarks commented: If only we had had this kind of information ten years ago, what a difference it would have made! I agree and am just grateful that teh PEN lucture series exists so parents now have the information to take reasoned steps with their child’s learning challenge.